The highly buzzed about “Dear White People” had it’s national release this past weekend, and the movie was well worth the wait. The hilarious viral campaigns that have flooded the net promised a funny, biting, social commentary about the state of the US and it’s race issues. The movie didn’t disapoint, as those short videos and meme’s only scratched the surface of what Director, Writer, Producer and all around awesome visionary Justin Simien wanted to accomplish with this film. The main feeling I was left with was one of joy that Simien got a chance to have his voice heard with this movie. You get the feeling that Simien has some amazing work ahead of him, because the characters in “White People” are so diverse, detailed, complex , intelligently written and REAL that makes it certain that Simien has more than enough material for some interesting movies down the line. There is no doubt that he can provide that interesting and new perspective that Hollywood NEEDS. On top of that he’s a skilled filmmaker, which “Dear White People” proves. There was so much going on in the film, I actually feel like I need to watch it a second time to do a proper analysis. It’s understandable that so much was crammed into the movie, because Simien was trying to get a point across. A very big and broad scope had to be covered, and as difficult a task that is I have to congratulate him for getting everything in there and still maintaining a plot that was easy to follow. “White People” takes place at Winchester University, a prestigious fictitious college dominated by white students (eh, like most colleges) and a spattering of blacks and other ethnicities. The film begins with tension about a new policy that forces students to randomly select the Houses they will live in, which the black students take offense to because it seems like it’s an undercover way to break up black culture in the school. While some of the white students are more concerned about their annual Halloween party and what the theme should be. All of this results in rallies, confrontations, misunderstandings and ultimately a riot. In between, the main characters go through typical College growing pains of identity, fitting in, dating and the like. Tyler James Williams as Lionel Higgins, the awkward gay student I completely related to. So, what did Simien want to say to white people? I think a lot of it has to do with the varying degrees of black characters in the movie. There’s Lionel (Tyler James Williams) a nerdy gay black gay who has a history of being tormented by other black kids, and is currently being tormented by his white house mates. On a personal note, I so related to this character and his aversion to trying to change himself to fit into a group, although he wants so desperately to fit in. Which leads him to some questionable reporting for the school’s paper and the sleazy editor George (Brandon Alter). There’s Coco (Tyonah Parris), the bougie girl from the Southside of Chicago who wants to escape her “ghetto” roots and find herself a “Gosling” (white boy). Troy (Brandon T. Bell) is the son of the Dean of Students (Dennis Haysbert) who is on track to become the next Obama, although what he really likes to do is write jokes and smoke weed when no one is looking. 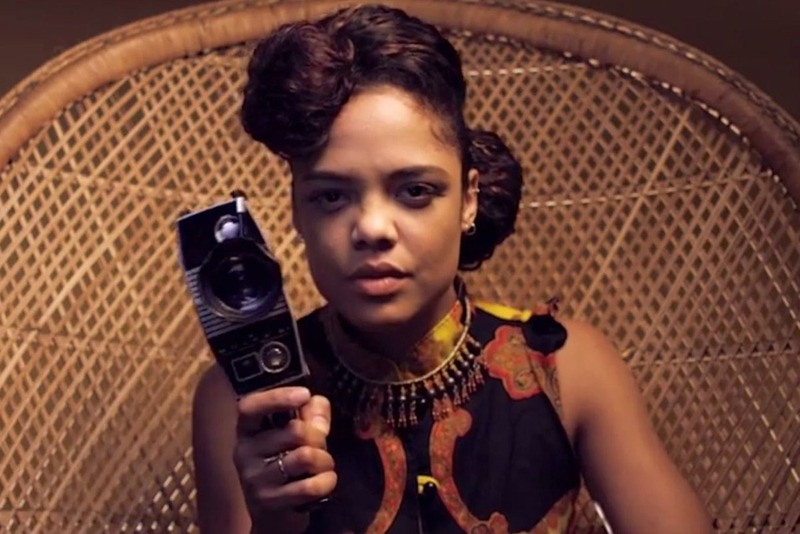 And of course there’s Sam (Tessa Thompson), the half black voice of the College radio station and creator of the controversial “Dear White People” segment of her broadcast. She’s the rebellious one, but she hides A LOT about herself from her league of supporters. It’s great that the movie presented all of these different archetypes of black people, as a way to say “We are not all the same, We all don’t think a like, We even have different thoughts and views on race issues”. In the end, the main point is to show that even with the different similarities, these characters all have the same basic wants and needs. The films presents these characters who are really unsure of themselves and their motivations, as outside forces are convincing them they need to be this or that. What they all really want is to be understood for the people they are on the inside. The entire cast does an excellent job in making Winchester feel real. The stand out performances come from Bell and Parris who are the two characters (imo) with the most internal conflict about what they SHOULD be and who they want to be. Funny thing is, with all the complex qualities about each character, they are all likable. Like I said earlier, the film needs multiple viewings because there is so much to cling to, each character is so detailed that they’d make interesting lead characters on their own. Even Kurt (Kyle Gallner), the son of the President (Peter Syvertsen) and the obvious villain, clearly has some inner issues that weren’t really delved into, I’d be interested to know more about him. Same goes for every single character, because at the end the viewer is so invested in their lives that we want to know what happens next. So yeah, Justin Simien has become my new Idol. He weaved some very interesting characters with great writing, great jokes, and great commentary on the state of the US and race. I look forward to hearing more from his unique voice.